The US fast food giant McDonald’s will no longer publicly announce its sales figures every month. Instead investors will have to wait for quarterly reports. The restaurant chain is seeking to reverse a decline in sales. As the company experiences one of the most dismal periods in its 60 year history, its boss Steve Easterbrook has unveiled a raft of measures designed to cut costs and boost sales. Now the firm has confirmed that it will no longer publish monthly sales figures. “To focus our activities and conversations around the strategic, longer-term actions we are taking as part of our plan, we have decided to discontinue our monthly sales disclosure, effective July 1st,” Easterbrook said Wednesday at a conference in New York. McDonald’s is not alone in refusing to announce its monthly sales figures. Its competitors, such as Pizza Hut, KFC and Taco Bell do not provide monthly sales information. As well as becoming tight-lipped about sales, McDonald’s said it would focus on improving quality. All restaurants are being told to toast their buns for longer to try and make their burgers juicier as customers turn to competitors such as Burger King. Other measures include more side by side lanes in drive-thru restaurants, getting employees to be more accurate with orders, franchising off restaurants and removing unnecessary layers of management. McDonald’s has already introduced a number of changes including only selling milk that is free from artificial growth hormones and chicken that hasn’t been reared on antibiotics. 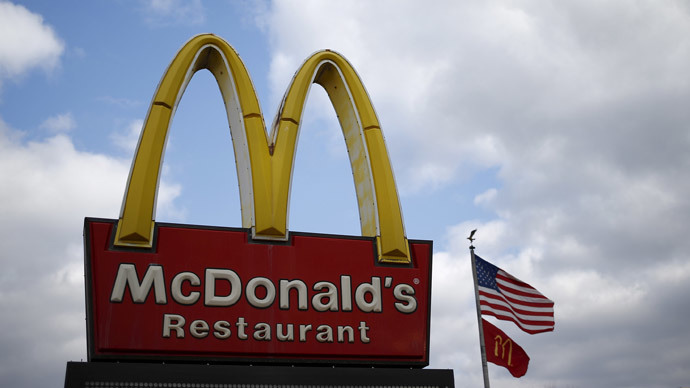 In the first quarter of 2015, McDonald’s sales fell by 11 percent. While in February US sales were even weaker than analysts had predicted. Sales in the US plunged 4.0 percent compared to an expected 0.7 percent fall. The latest measures to try and boost profits follow announcements last month of sweeping closures of underperforming stores. On top of 350 planned closures another 220 loss-making restaurants were shut in the first three months of 2015, mostly in the US and China as well as 130 in Japan. But it is in its home country the US where McDonalds is feeling the most pain. Easterbrook acknowledged that the firm had “failed to keep pace” with what customers wanted. “Some of the challenges we’ve had in the US have been somewhat self-inflicted,” he said. McDonald’s is also facing demands from US workers for a $15 an hour minimum wage.